IoT is now everywhere. Here you will find all the steps to make a connected wallet yourself. During our last year of engineering school we designed a connected wallet (named Long Life). The principle is simple: when the wallet is far from you (it is lost) you will see your position (the position of the smartphone) and the position of the wallet on the application. With this product you will never lose your wallet ! When the wallet is at a distance of 100 meters then we lose the bluetooth connection with the smartphone. This loss of connection will trigger the sending of a message, containing the position of the wallet, on the Sigfox network. This message will be directed by a callback on a cloud using a POST method(address: /longlife). On the cloud there will be a database with all customers and their position. On the smartphone side it will be necessary to perform a GET method (address: /recuplonglife). From this one, we recover the position of the wallet that must be placed on the map of the mobile application. The Sigfox module will be powered by the NRF51822 P0_13 pin and the Grove GPS will be powered by the P0_19 pin. Les deux modules sont connectés à la même liaison série UART. Ils seront allumés chacun leur tour lorsque l'on aura besoin d'un module. Click on "Add to your Mbed Compiler". Just click on "New" then choose the NRF51822 card and you can start from the example of SimpleChat Bluetooth that can be controlled by a mobile application.We will connect the wallet to the application via Bluetooth to ensure the proximity of the 2 devices. We store this frame in a buffer and we will turn off the module again. We will then cut this frame to recover only the longitude and latitude, which we will then convert from decimal degrees to radial degrees and then multiply by 10000 to convert to an integer. We now feed the Sigfox module and the serial link sends the Sigfox message. In order to send the portfolio details on the Sigfox network we use the P0_9 and P0_11 PINS which correspond to the PIN RX and TX of our microcontroller nRF51822. In addition, we feed a buzzer to make a sound to realize that we lost his wallet. You will find the whole code in the annexe. In order to have an Android application we used the Android Studio software. On our application there will be a map with our position and position of our wallet. In order to display this map, we will use the Google Map API (https://developers.google.com/maps/documentation/android-sdk/start). There was a problem because the database was not working on Bluemix so we signed up on https://fred.sensetecnic.com/. And that's it! You now have a connected wallet. It is used to find your connected wallet. 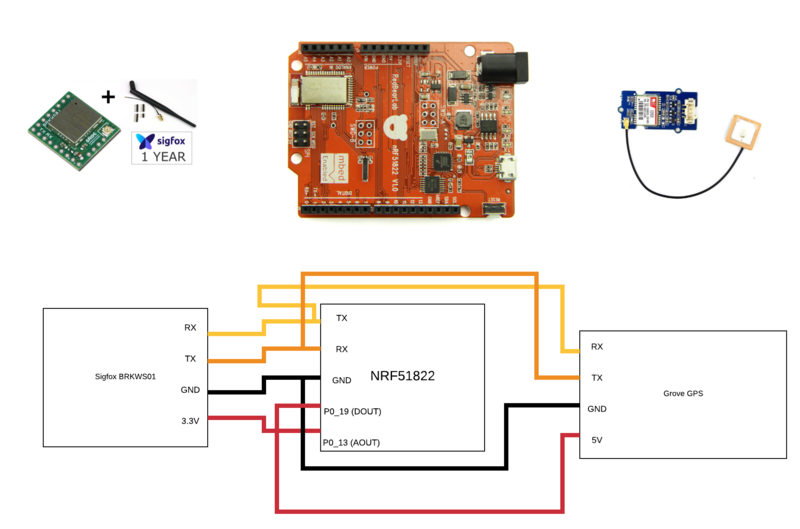 The code is used to program the NRF51822. *    The application works with the BLEController iOS/Android App. *    to the BLEController App or vice verse. *    Characteristics received from App will print on Terminal. // 100ms; in multiples of 0.625ms.